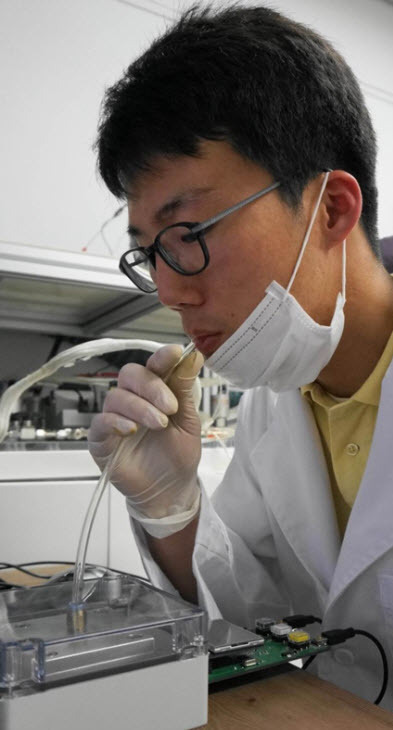 Researchers at the Korea Advanced Institute of Science and Technology (KAIST) have developed a highly sensitive exhaled-breath sensor, using tin dioxide (SnO2) fibers assembled from thin, wrinkled SnO2 nanotubes. These metal-oxide nanofiber-based chemiresistive gas sensors allow for portable real-time breath tests that could be available on smart phones or tablets in the near future. They sensors allow for diagnosing serious diseases such as diabetes or lung cancer quickly and effectively by simply breathing into a small nanofiber breathing sensor, mounted on a phone or other device.. The SnO2 fibers, called “micro phase-separations,” are generated between polymers and dissolved materials while varying the flow rate of an electrospinning solution feed and then applying a heat treatment. 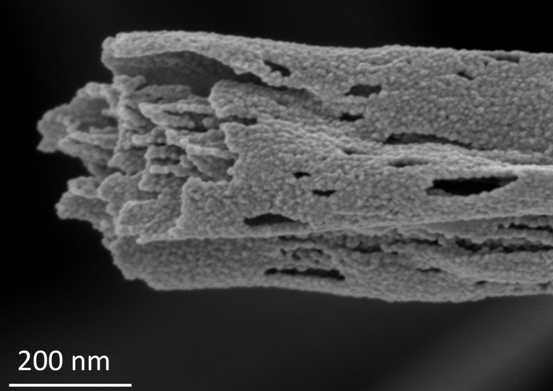 The change in form results in nanofibers shaped like an open cylinder. Inside the cylinder, thin-film SnO2 nanotubes are layered and then rolled up. A number of elongated pores ranging from 10 nanometers (nm) to 500 nm in length along the fiber direction are formed on the surface of the SnO2 fibers, allowing exhaled gas molecules to easily permeate the fibers. The inner and outer walls of the SnO2 tubes are evenly coated with catalytic platinum (Pt) nanoparticles. According to the research team, highly porous SnO2 fibers, synthesized by eletrospinning at a high flow rate, showed five-fold higher acetone responses than that of the dense SnO2 nanofibers created under a low flow rate. The catalytic Pt coating shortened the fibers’ gas response time dramatically as well. The breath analysis senses specific volatile organic compounds (VOC) produced in the human body to signal the onset of particular diseases. Different biomarkers predict specific diseases — acetone for diabetes, toluene for lung cancer, and ammonia for kidney malfunction. Breath analysis for medical evaluation has attracted much attention because it is less intrusive than conventional medical examination, fast, convenient, and environmentally friendly, leaving almost no biohazard wastes. Various gas-sensing techniques have been adopted to analyze VOCs including gas chromatography-mass spectroscopy (GC-MS), but these techniques are difficult to incorporate into portable real-time gas sensors because the testing equipment is bulky and expensive, and their operation is more complex. 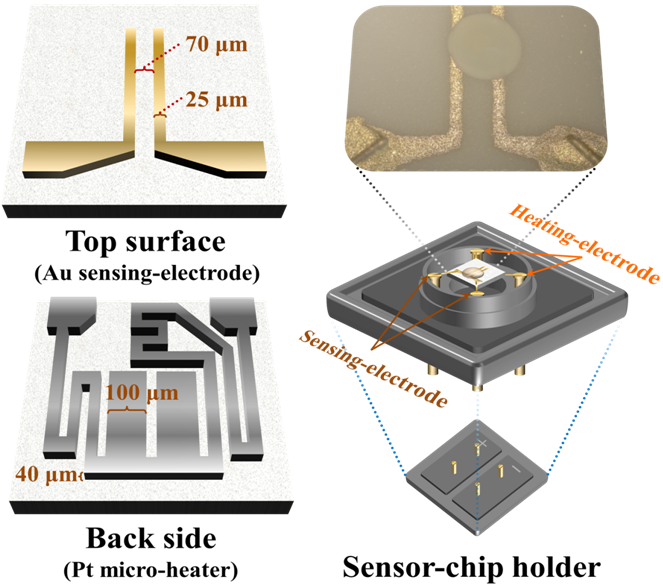 Metal-oxide based chemiresistive gas sensors, however, offer greater usability for portable real-time breath sensors, according to Il-Doo Kim, Associate Professor, KAIST Materials Science and Engineering Department. 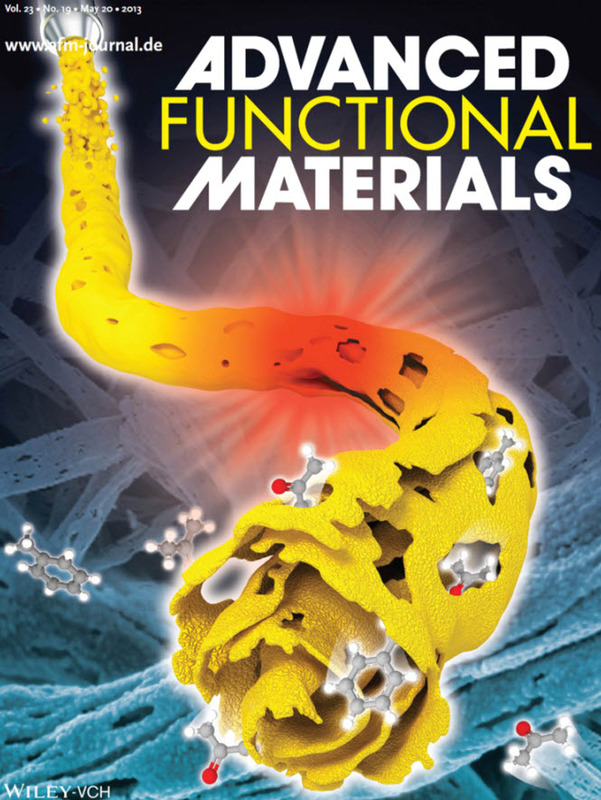 “Catalyst-loaded metal oxide nanofibers synthesized by electrospinning have a great potential for future exhaled-breath-sensor applications,” he said. The exhaled acetone level of diabetes patients exceeds 1.8 parts per million (ppm), which is two- to six-fold higher than that (0.3-0.9 ppm) of healthy people. So a highly sensitive detection that responds to acetone below 1 ppm, in the presence of other exhaled gases (and also under the humid environment of human breath), is important for an accurate diagnosis of diabetes. “A trace concentration of toluene (30 ppb) in exhaled breath is regarded to be a distinctive early symptom of lung cancer, which we were able to detect with our prototype breath tester,” he said. The research team is now developing an array of breathing sensors using various catalysts and a number of semiconducting metal oxide fibers, which will offer patients real-time easy diagnosis of diseases. “We already tested one time with diabetes patients and we are going to conduct in-depth clinical trails at a hospital in Korea within a couple of months,” Kim told KurzweilAI.